Oi! Who pinched my strawberry! 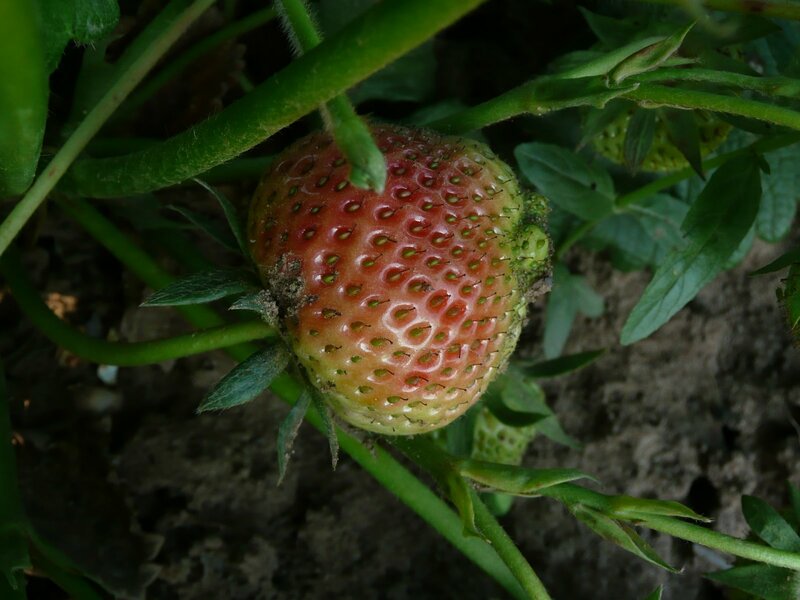 Remember the strawberry, the first strawberry that was going to ripen..
Its gone, its been pinched! (We were just left with an empty stalk, very upsetting it was) By what we do not know, its not slugs as they dig in have a feast and leave fruit damaged, not pinch the whole thing. It could be a bird, again the whole thing has disappeared there are no little tiny bits of fruit lying around. It looks suspiciously like another human. I have this view in life, if someone pinches a cabbage or a few spuds then its probably because they need it and if they need it that bad they can have it. But for someone to nosy around my plot and then pick the choicest of morsels (and the First! which is the main thing really) well that’s a bit mean spirited. There is also the wandering about my plot in the first place! Hubby has now found a padlock to lock the gate with. So they will have to climb the fence if they want to pinch my strawberries. Which is easy enough to do, but its easier to spot by the other plot holders and then question why somebody is climbing a fence to get in. It has come to my attention. Wish i could have a fence around my plot. I have problems with people taking things.. My plums, I expect a few to be picked when they pass by and i did tell two of my neighbours to help themselves but last year someone stripped the tree bare in a few days. It was a good year for fruit and the tree was heaving, so they must of walked off with bags full.. Hardly any had dropped, they just vanished in about three days..People can be so selfish. It happened close to our open day, lots of preserves being made for judging. I’ve also had wood ash taken – 4/5 drums full,every time i burn they empty it.. which i think is extremely selfish after i did all the hard work of cutting down and burning they get the benefit or their soil does..
Could it be a rat? Last year, a rat (or rats) would steal our sweetcorn and drag the cobs away to munch. It is a great nuisance when these things happen in a place that should be your little oasis, but unfortunately they do. I had a lot of things stolen from my plot last year including wood, a table and outdoor umbrella, for sunny weather like today, but not yet of my vegetables. Its a shame that people trespass. I had to put a padlock on the gate too. It shouldn’t be this way, but it is, it sure shows how ugly, selfish and ‘greedy’ some human beings are in their nature.